The Greek God Pan is perhaps the most familiar form of the Horned God/Wild Man archetype here as a pendant in sterling silver by Oberon Zell. Divine guardian of the flock and fields, Pan projects the lusty sensuality of the Primal Male in his roles as progenitor and protector of the Wildwood. He is also known as the Lord of the Dance making him a wonderful gift for dancers. Meticulously crafted in sterling silver, Oberon Zell's modern interpretation of Pan celebrates the primal power of lusty male energy. Measures 1 1/2 inches high. Our classical imagery of this country-dwelling deity is derived from the Homeric Hymn to Pan. He is an ancient god indeed, harkening back to the old hunter/gatherer societies with their horned or antlered shamanic gods. But with animal domestication Pan became the herdsman's god associated with goats. His original worship was in Arcadian Greece. 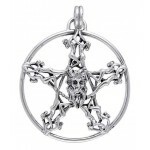 Made to order by hand especially for you of the finest .925 sterling silver - please allow about 3 weeks for delivery. Item Number: PS-TPD1021 | Approximate Size (Inches): 0.25 wide x 0.25 deep x 1.50 high | Approximate Shipping Weight: 0.25 lbs. This youthful depiction of Pan, one of the oldest Gods of the Greek pant.. 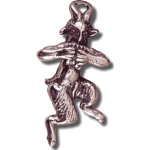 The Greek God Pan is perhaps the most familiar form of the Horned God/Wi..